French painter and museum director. In 1817 he entered the Acadmie des Beaux-Arts in Paris, where he studied under Antoine-Jean Gros. In 1821 he won the Prix de Rome with Samson Handed over to the Philistines by Delilah (1821; Paris, Ecole Normal Suprieur). He began exhibiting at the Salon in 1824 and in 1827 showed Scene from the Deluge (1827; Lyon, Muse des Beaux-Arts), painted while he was in Rome, and the Death of Caesar (Paris, Louvre). The latter proved a sensational success: it was initially bought by the Muse du Luxembourg, Paris, and was re-exhibited in 1855 before being sent to the Louvre. The subject derives from Plutarch and shows Antony stirring the Roman citizens to avenge the murder of Caesar. It was praised chiefly for its dramatic composition. He was successful as a portraitist at court and in aristocratic circles. 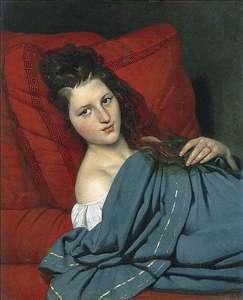 See more details about "Half-length Woman Lying on a Couch"
See more details about "Young Girl at the Scamander River"